The word goose (plural: geese) is the English name for a group of waterfowl, belonging to the family Anatidae. This family also includes swans, most of which are larger than true geese, and ducks, which are smaller. A number of other waterbirds, mostly related to the shelducks, have "goose" as part of their name. 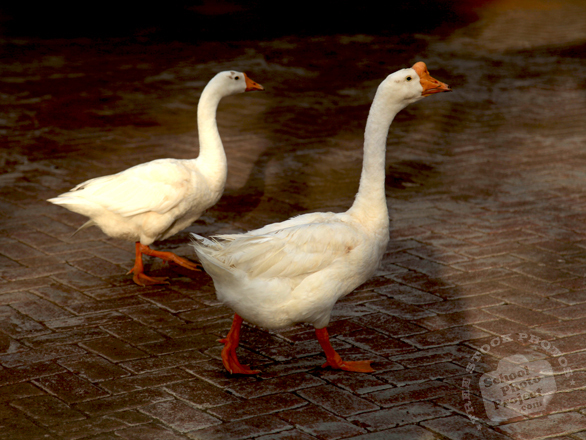 The term goose applies to the female in particular while gander applies to the male in particular. Young birds before fledging are called goslings. The collective noun for group of geese on the ground is a gaggle; when in flight, they are called a skein, a team or a wedge; when flying close together, they are called a plump.